Now that the holidays are over, there’s only one thing I know for sure – I am broke. That dreamy, present-filled spirit of giving has disappeared and all I’m left with is an empty checking account and scraps of fabric, wrapping paper and cardstock. It’s time pull start brainstorming ideas for frugal craft projects that make use of my mountain of discards. Luckily, there are plenty of amazing craft tutorials and projects on FaveCrafts that will satisfy your creativity without abusing your wallet. Scrap fabric crafts are an ideal way to use up items you already have. 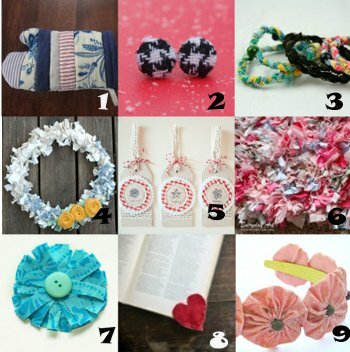 Even an inch of fabric can go a long way – just check out the tutorial for button earrings. Scrap fabric projects can come in so many shapes and sizes – you’ll find as many giant wreaths as you will skinny wrap bracelets. Not sure what to make first? Cut up an old t-shirt and create a Braided Fabric Belt. Take your green crafting to the next level by adding in a belt fastener that’s made from a recycled plastic bottle. Another fun and easy craft to try is Fabric Scrap Bracelets. No need for a needle and thread – grab a glue gun, some scraps and wooden bangles for this project. Not all scrap fabric crafts have to be worn, either. You can use old bandanas (or any other fabric) to create a Colorful Fabric Book Cover. Students will love this crafty alternative when it comes time to covering their textbooks (no need to invest in brown bags or store-bough fabric covers). It’s not too late to make (and keep) a New Year’s resolution, so resolve to go green in 2013. Start by saving your fabric scraps instead of throwing them away – you’ll cut down on your overall trash haul and end up saving money when shopping for fabric.